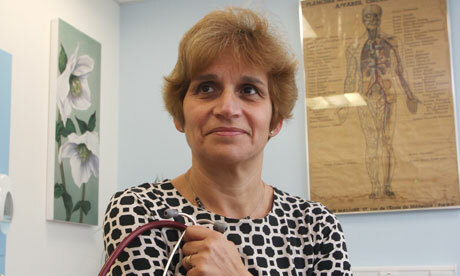 “We need to remind ourselves why we entered this profession” Dr Clare Gerada, Chair of the Royal College of GPs. We worked with Dr Clare Gerada on her keynote speech to the annual conference of the Royal College of General Practitioners (RCGP) in October 2011. She received an unprecedented standing ovation from the 1500-strong conference audience, and the speech was widely covered in the national and trade press. It was also featured as Speech of the Week by the US journal of thought-leading speeches, Vital Speeches of the Day. I’d like to tell you a story about a GP, a radiologist, a pathologist and a psychiatrist. Sounds like the first line of a joke, but it isn’t. The GP was me. We were having dinner with our children at an open-air opera in Germany. The place was packed. Everyone was having a good time, when the dreaded happened. Out of the corner of my eye, I saw an elderly man fall headfirst into his plate. The four of us looked at each other. We knew our meal was over and we swung into action. Each working to type. The psychiatrist tending to the man’s wife. The radiologist searching for a defibrillator. The pathologist pounding on the poor man’s chest. Me giving mouth-to-mouth. From the way he keeled over, it was obvious he was dead. But we knew there was still plenty for us to do. We had to comfort his distressed wife. And we had to keep the crowd calm for 30 minutes, till the paramedics arrived. “Care for people,” he said. His reply surprised me. Not just because impressing teenage children isn’t easy. But because what impressed him wasn’t the glory and the drama of our public display of medical skill. No. What impressed him was our simple act of caring. Caring for a sick man. Caring for the man’s wife. And caring for the people in the crowd. That’s what inspired my son. And that’s how my father inspired me a generation ago. It wouldn’t be allowed now, but he used to take me with him on home visits in the postwar slums of Peterborough. I watched him treat children with measles and care for the dying in their homes. That’s when I knew I wanted to be a doctor. Why did I tell you that story? Because I believe each of us has a story about what inspired us to become a doctor. A story that made us what we are today. A story that lights our way to the future. Our stories have never been more important. Especially now, when our profession is under pressure to replace the language of caring with the language of the market. We need to remind ourselves why we entered this honourable profession in the first place. When I come home from work and my son asks me what sort of day I’ve had, on a good day I want to be able to say “I saved a life”, not “I met a budget”. Of course, it’s important that GPs are mindful of resources. We have a responsibility to spend the public’s money carefully and wisely. That goes without saying. But we must never lose sight of the patient as a person, at the heart of our practice. Patients are not “commodities” to be bought and sold in the health marketplace. In this brave new cost-driven, competitive, managed-care world, I worry about the effect the language of marketing is having on our clinical relationships. It’s changing the precious relationship between clinician and patient into a crudely costed financial procedure. Turning our patients into aliquots of costed tariffs and us into financial managers of care. We are already embracing the language of the market when we talk about, for example, care pathways, case management, demand management, productivity, clinical and financial alignment, risk stratification. We’re already accused of making “inappropriate referrals” whenever we put what’s best for our patients above what’s best for saving money. We’re being forced to comply with referral protocols and so-called rules-based medicine, in an effort to control medical care before it’s delivered. Referral management systems – already widespread – place a hidden stranger in the consulting room. A hidden stranger who interferes with decisions that should be made by GPs in partnership with their patients. Insulting terms, like “frequent flyers”, are being used to describe people who are sick and need our care and attention. The archbishop of Canterbury attacked what he described as “the quiet resurgence of the seductive language of the deserving and undeserving poor”. If we don’t watch out, the deserving and undeserving poor could soon be joined by the deserving and undeserving sick. I worry we’re heading towards a situation where healthcare will be like a budget airline. There’ll be two queues: one queue for those who can afford to pay, and another for those who can’t. Seats will be limited to those who muscle in first. And the rest will be left stranded on the tarmac. This can’t be right. After all, no one chooses to be sick. We must hold fast to the principle that good healthcare should be available to all, regardless of wealth. Of course, there have always been health inequalities. But my concern is that despite all the talk of reducing these inequalities, the size looks set to increase, not decrease. So what about GP commissioning? Will it help us reduce health inequalities? And will it enable us to deliver better care to our patients? People often tell me that GPs make good commissioners because of the population-focus we bring to care. After all as a profession we see 300m patients per year. If anyone can be said to have their finger on the pulse of the nation, surely it’s us. It’s an argument I’ve supported for decades. But we must tread carefully in this brave new world and do everything in our power to make sure it’s the public’s pulse we have our fingers on – not the public’s purse. Which is why I believe that big decisions – decisions like whether to close hospitals – should be the responsibility of governments, not GPs. It’s the government’s job to decide how much we invest in healthcare and what services the NHS should provide. Of course we should do our bit – we already do, by sitting on Nice, Sign and other committees. But governments should have ultimate responsibility for decisions about rationing healthcare, not GPs – guided and advised by us, for sure, but finally the decision must be taken by a publicly accountable body, not an individual doctor or a group of doctors. We don’t shirk our responsibilities. Governments shouldn’t shirk theirs either. Rhetoric about putting doctors in charge doesn’t convince me. In this brave new world it’s the market – led by CEOs, shareholders and accountants ‚Äì that will be in charge, not doctors. We mustn’t allow ourselves to be compromised. Our first responsibility must be to the patient in front of us. Our next is to the patients in the waiting room. After that comes our responsibility to those on our list. And then to our local community, and finally the wider population. In that order. I’ve always said that good commissioning is about being a good GP. It’s about understanding how we use resources fairly and effectively. But whatever happens we must make sure that the commissioning agenda isn’t allowed to compromise our relationship with the patient in front of us. We must not risk long-term benefits being sacrificed in favour of short-term savings. How soon will it be, for example, before we stop referring for cochlear implant? An expensive intervention, but one that, in the long term, saves enormous amounts of public money. But not a saving from our budget. How long will it be before we find ourselves injecting a patient’s knee joint – at Injections-R-us plc – instead of referring to an orthopaedic surgeon for a knee replacement? And, once referred for hospital treatment, patients must be able to trust their doctors to base care on need and not on making money for the hospital. If you think this is far-fetched, the Economist calculated that in 2009 the market-driven, corporate-dominated US healthcare system generated around $300bn of charges for unnecessary care. This represented 10% to 12% of US healthcare spending for that year. This means women having unnecessary hysterectomies. This mean men having unnecessary angiograms. This means adolescents being given antidepressants for no reason. Do we want that here? As doctors we risk being doubly compromised. We’ll have to choose between the best interests of our patients and those of the commissioning group’s purse. And, to make matters worse, we’ll also be rewarded for staying in budget – and not spending the money on restoring that child’s hearing. It goes by the quaint title of the “quality premium”. Now that’s what I call a perverse incentive. We are told that one of the reasons clinical commissioning is being introduced is to reduce the spiralling costs of healthcare. But if the American experience is anything to go by, the opposite will be true. He describes health maintenance organisations (which have the same function as our clinical commissioning groups) as finding themselves in “a deepening swamp of commercialism over service, of profiteering over professionalism, of denial or rationing of care where such care is critically needed, of depersonalisation of intensely personal kinds of relationships”. Is this what we want here? The NHS can always be improved, but we must do it very carefully, so as not to lose what we and previous generations of doctors like my father have achieved. As Allyson Pollock reminds us, the NHS was not an experiment. It wasn’t a mythical utopia either. The reality is that for more than 50 years it has delivered high-quality care for most patients, most of the time. Can the market achieve similar outcomes? There is plenty of evidence that market-driven health services lead to limited choice, escalating costs, reduced quality. And let’s remind ourselves, the biggest health market in the world, the US, has achieved the remarkable double whammy of having the most expensive system in the world and the greatest health inequalities. It comes near the bottom of the league for most health outcomes – and boasts an unnecessary death every 12 minutes. So what can we do? It would be easy to feel discouraged. But I know we all want the best for our patients, we always have and we always will. And as long as we do what we know to be right for patients, we will keep their trust. And we can do this by ensuring that the systems we work in continue to allow us to work ethically and always as our patients’ advocates. We must resist the encroachments of the market wherever it threatens our freedom to serve our patients and our communities. This is what those of you leading commissioning must promise us. We have to get the actuaries, risk-adjusters and shareholders out of the health service, and put clinicians (not just medics) back in charge of it. And then we need to bring in management staff to advise and assist us. Staff who are truly committed to the values of our NHS. We all became doctors because we wanted to make a positive difference to people’s lives. It would be hard to devise a better and more inspiring way of achieving this than through the provision of excellent general practice care, within a universal health service. In times of austerity, we need to come together so that we can collaborate, co-operate and innovate – not compete against each other. You expected me to talk about the health bill in England, but this bill, like other reorganisations across the whole of the UK, will come and go. Instead I have chosen to talk to you about what matters to our patients, now and for ever – a doctor who cares. I am convinced that there are enough of us to create a revolution in healthcare. Not a revolution that the government is talking about in the bill – in structures, payments and competition. But a revolution in values. One that will provide excellent care to our patients. Where in every interaction we pinch ourselves at the honour we have been given to be privy to their secrets and pain – and as Don Berwick says, “being allowed to be guests in their lives”. My message to you is simple and clear. My son wanted to do medicine because of what he saw me and my friends do: care. If we want to keep serving the best interests of our patients, we must reject the language of the market and embrace the language of caring. And keep telling our stories.